Battery inverters come in many different forms depending on the application. A battery inverter is a general family of products specifically encompassing hybrid inverters, inverter chargers, offgrid inverters and charge controllers. Each is designed to work in with lithium ion, lead acid (or both) battery banks at either low voltages (12,24,48V) or high voltages (100-500V). A more detailed explanation of each is available below. At Sustainable Solar Services, we offer a wide variety of battery inverters from industry leading manufacturers. All battery inverters within our product range come with a minimum 5 year product warranty as standard with options to increase up to 10 years. More information on our battery offerings can be found in our Solar Batteries Section. We have a range of battery inverter and battery packages to suit any installation. Our packages offer excellent pricing compared to purchasing items individually. Hybrid inverters are the simplest battery inverters for integrating solar and battery storage systems into a home or business. As the name suggests hybrids are an all-in-one unit consisting of a solar inverter, a charge controller and in the case of several of our offerings a battery management system. By facilitating whether to charge batteries from solar or the grid, discharge batteries into the home or power the home from solar, there is much greater control over how and when energy is used. This provides much greater energy independence from the grid and also offers protection from rising electricity prices. With many customers interested in battery solutions but turned away by the upfront costs installing hybrid inverters now and batteries further down the line represents an inexpensive solution to futureproof a customers system. Check out our Fronius and Sungrow hybrid inverter options for more information. Datasheets and technical information for our hybrid battery inverters can be found in our Downloads Section. Inverter chargers are sometimes known as “dedicated” battery inverters as they interface directly with batteries and invert their DC power into useable AC power for the home. Inverter chargers can be used in conjunction with charge controllers to form an offgrid solar and storage system. They are more commonly used these days for retrofitting batteries to existing solar systems or installing batteries where no solar exists for energy arbitrage. By retrofitting batteries to existing solar systems using an inverter charger the original solar system does not have to be modified, meaning no changes in warranty or compliance and ensuring a simple solution. We offer inverter chargers from SMA which are compatible with high voltage batteries such as the Tesla Powerwall, LG Chem and BYD B-Box. Datasheets and technical information for our inverter charger battery inverters can be found in our Downloads Section. Offgrid inverters are used to simulate the grid in situations where there is no grid connection such as a rural property or homes that have decided to go offgrid. These offgrid inverters are able to interface with standard solar systems, batteries, generators and the home to be able to turn any home into an off-grid home. As the offgrid inverter is able to control standard grid connected inverters it is possible to transform any existing system into an offgrid system. We offer SMA’s Sunny Island offgrid inverter for all offgrid applications. Datasheets and technical information for our offgrid battery inverters can be found in our Downloads Section. 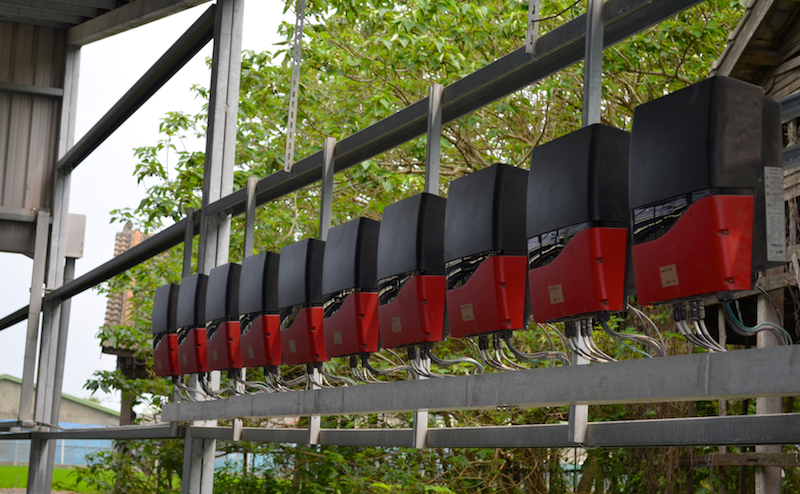 Charge controllers take the DC power supplied from solar photovoltaic panels and regulate this to directly charge a bank of batteries. If DC loads are not being used an inverter charger is required to invert the batteries DC power into AC. As there is no conversion step from AC to DC between the panels and battery, charge controllers offer the highest charging efficiency of the battery inverter options. Datasheets and technical information for our charge controllers can be found in our Downloads Section. For more information or special product enquiries please Contact SSS.